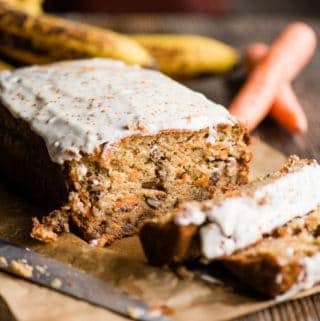 Carrot Cake Banana Bread is the best of both worlds! Super moist, perfectly sweet, and glazed to perfection – you won’t be able to stop at one slice! 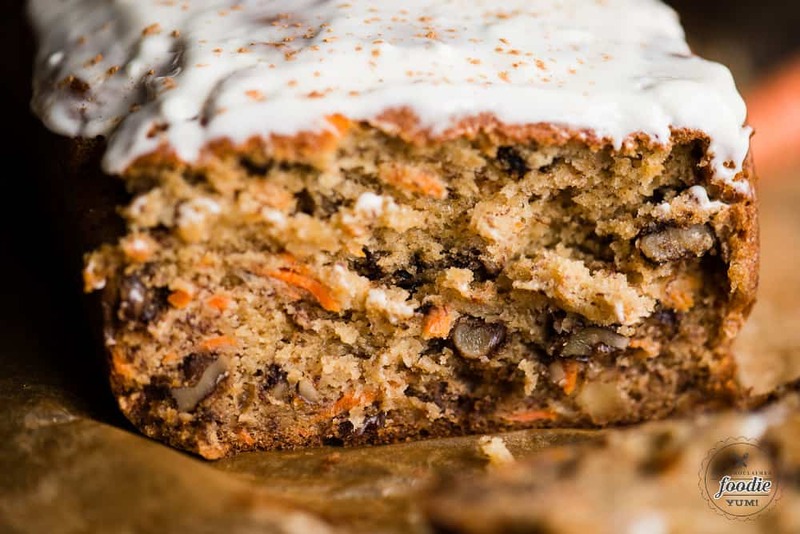 If you are a lover of carrot cake and a lover of banana bread, this recipe will change your life. Perhaps that’s a bit dramatic, but you get the idea. 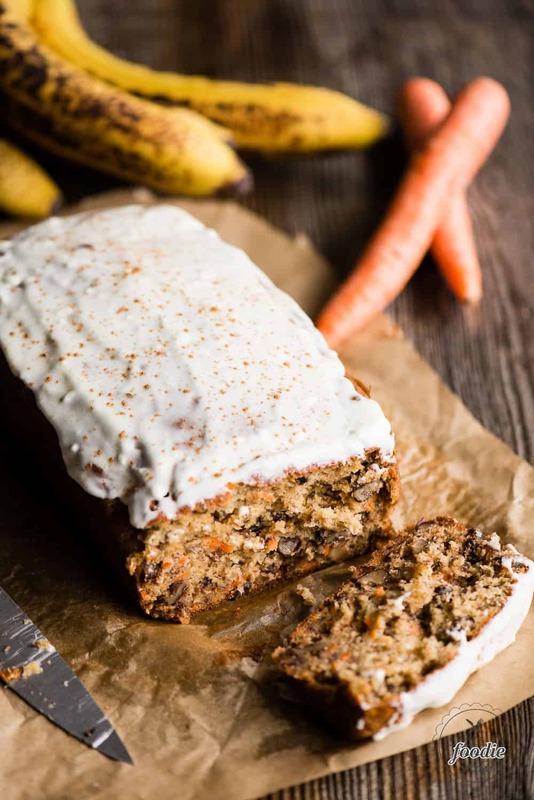 I don’t even remember why I made this Carrot Cake Banana Bread. I’m sure it was because I had overly ripe bananas on the counter that needed to be used up. This is what I call a recipe mash-up. Kind of like when I made my Banana Bread Brownies. I love me some banana bread and I’m constantly making different variations! I swear, I don’t know why I pick up a bunch of bananas every time I visit the grocery store. 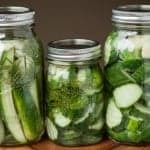 Especially during the summer months when I have an overwhelming amount of seasonal local produce. Plus, they go from yellow to spotted brown in a single day! 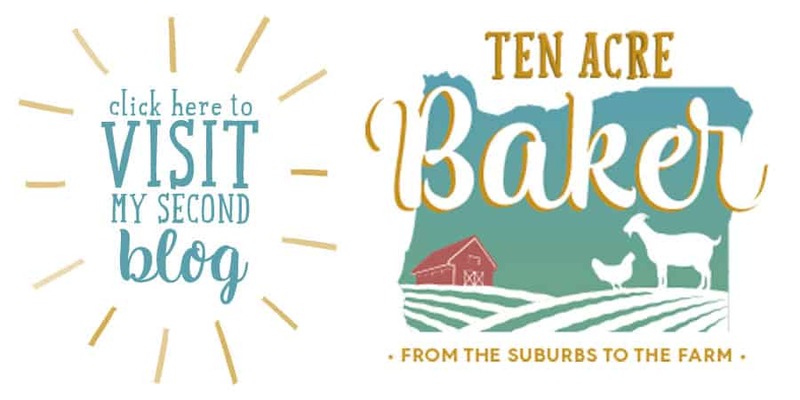 All the more reasons to make use of them in recipes like Banana Cream Pie, Banana Pancakes, and Banana Upside Down Cake! 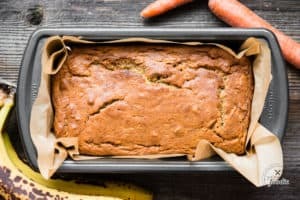 This is an especially moist banana bread recipe. Some people like a real dense banana bread. You know the kind. So heavy and thick that a hot cup of coffee is required just to wash it down. I much prefer a moist banana bread where no beverage is required. 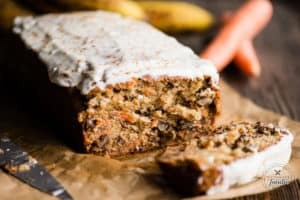 I used my base banana bread recipe that has been tested and eaten over and over again and basically added shredded carrots. 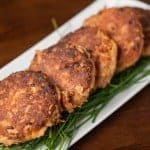 The carrots only add moisture, texture, and that sweet carrot flavor. This glaze is definitely stuck somewhere between a thin glaze, like what you would find on a doughnut, and a frosting. The consistency is pretty much right in the middle. It’s easy to pour on but requires a little help to evenly spread out. 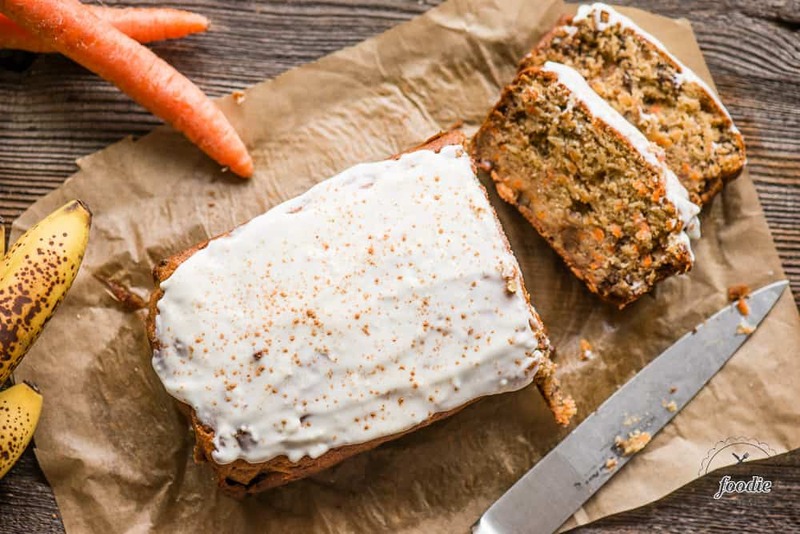 The reason I added the cream cheese glaze was because this quickbread loaf closely resembles carrot cake, and you just can’t have carrot cake without some kind of cream cheese frosting. Preheat oven to 350 degrees F. Line a loaf pan with parchment paper or heavily grease with butter. In a large bowl, cream butter and sugars together until light and fluffy. Add eggs, bananas, carrot, vanilla, and sour cream. Mix until well combined. In a small bowl, combine flour, baking soda, pumpkin pie spice, and salt. Add large spoonfuls of the dry ingredients to the wet ingredients and stir just enough to fully incorporate. 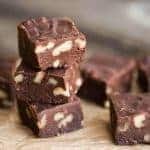 Once all of the dry ingredients have been mixed in, fold in the walnuts. Add batter to prepared pan and cook in preheated oven for 60 minutes. remove from oven and allow to cool in pan on cooling rack for about 10 minutes. Remove loaf from pan and allow to finish cooling fully on rack. 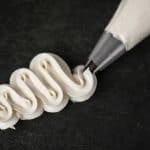 Using whisk attachment on stand mixer, beat cream cheese until extremely light and fluffy. Beat in powdered sugar until fully mixed. Stir in vanilla and milk and whisk until fully combined. If you prefer your glaze to be thinner, add more milk. Drizzle over cooled loaf.